Don’t you yearn for a time when you could be carefree and have just about everything done for you? Even though we have what, to us, seems like the best job in the world, we still get worn out from time to time and miss the simpler times. That’s why we scoured the earth for the perfect costume to suffice our nostalgic thirst and this is what we’ve found. 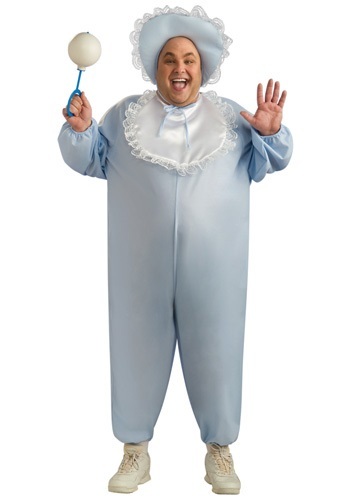 This Adult Baby Boy Costume will be the perfect Halloween costume for you to feel like the little bundle of joy you once were. This soft blue jumpsuit will make you appear as innocent as a newborn. Then once you add the white bib and the baby blue bonnet to the rest of this costume the transformation will be complete. You’ll be more than ready to get just as much attention as a baby, so start practicing your cooing and goo-goo-gah-gahs. To kick this costume up to the next level you can take a quick look through the rest of our baby-themed accessories. Grab yourself an oversized baby bottle or a giant pacifier to run around with, but be sure to have a handy noise-maker, like a jumbo rattle, in your hand at all time. Nobody can get away with making as much noise as a baby, so we would take full advantage of the opportunity! Go back to the good ole days this Halloween when you grab this Adult Baby Boy Costume. Hide away from the responsibilities of the real world for a night and reclaim that awesome period of life!